Sure, we would be lying if we said we weren’t big fans of website builders like Weebly, Wix, and Shopify. Their commitment to simplicity of use has made millions of customers the webmasters of their own websites. However, there are scenarios for which website builders just aren’t the right tool. We use WordPress.org on a daily basis. With this guide we want to show you when it makes sense to use WordPress, when it doesn’t and how to create your own WordPress site. The main difference between WordPress.org and a hosted website builder like Weebly and Wix is the level of complexity. While you barely ever get in touch with the technical side of things using a website builder, you will indeed need some technical understanding in order to run a website with WordPress.org. You’re a real estate agent and want to offer potential clients a database to search for real estate. You want to offer a premium membership area with online payment features. You’re looking for an especially impressive design which supports all the latest technical features while remaining flexible enough to adjust the code. Your competition is strong, and you need especially advanced SEO features. Flexibility and database integration are very good arguments for at least considering WordPress.org. Please note: This article will only cover the open source version, WordPress.org. WordPress.com, which is easier to set up, is much more reduced in features and really only useful for blogs, while .org can be used for practically any kind of website. Free: The software is completely free and can be downloaded on the web. Hosting and premium templates, however, must be purchased. Installation: Unless you choose a hosting provider who offers a 1-click installation procedure, installing WordPress manually is not exactly trivial, and it requires some basic technical knowledge (FTP, MySQL, etc.). Great flexibility and future-proof: Unlike a website builder, you can change anything you like in the code to suit your wishes – but you’ll need to code. Additionally, WordPress is by far the largest content management system (CMS) in the world, which is precisely why it won’t be disappearing anytime soon. Maintenance and security: One of WordPress’ great weaknesses is that you need to update the software on a regular basis, or your website can become compromised. The update procedure itself is simple (one click), but individual plugins may cause problems which could, in turn, disable your entire website in a worst-case scenario. Unless you have sufficient technical skills, this may go beyond the limits of your abilities. Your choice of web host: You can move your WordPress website from one hosting provider to another with little effort. There are also several providers who specialize in WordPress (see examples below). No direct support: While there are forums where you can ask for help, these people are volunteers, and you can’t always expect people to have an answer for you. Templates: You will not find a CMS with a greater variety of templates than WordPress. Sites such as Themeforest and Elegant Themes offer plenty of designs ready for immediate use. No WYSIWYG: When entering content, you don’t immediately see what the end result will look like because the typing is done in an abstract interface mask. Website builders, on the other hand, offer a true “What You See Is What You Get” experience. Plugins: There are plugins for just about any scenario you can think of including e-commerce, member pages, multilingual websites, booking engines, etc. Community: While you will receive no professional technical support the way a website builder offers it, there are thousands and thousands of programmers who specialize in WordPress. How Do You Set Up WordPress, and Where Do You Get a Domain? Basically, you can install WordPress using any hosting service that offers PHP and MySQL support. 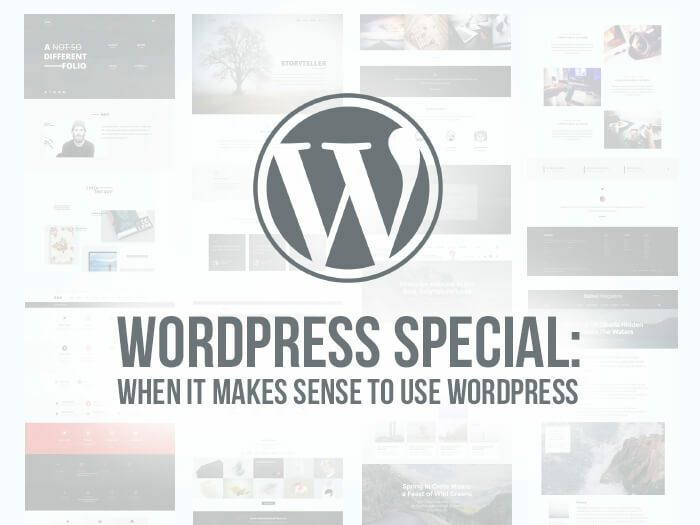 It gets even easier if your webhost offers a special WordPress package. Such plans usually start at $4 to $7, which makes them just as expensive as your run-of-the-mill website builder. Often times, a domain and e-mail addresses will be included. One.com is one of the most affordable hosting company we’ve heard of. Although they don’t come with every feature professional WordPress developers may need, they are a suitable provider for small and medium projects. On top of that, they offer a solid website builder. Their cheapest plan is $2.45 month. Unbeatable! We’ve put together a tutorial where you can see how to easily install WordPress with their 1-click solution. BlueHost is one of the most famous WordPress hosts. The starter plan in the shared hosting section is usually sufficient for the beginning. Its regular price starts as low as $2.95 per month. One of the biggest advantages is the one-click installation procedure. It helps beginners to get started right away. However, when your WordPress-based website starts to grow and attract more and more visitors, your loading times could get significantly worse. This is due to the fact that, on the starter plan, you share your server with other websites (a setup called shared hosting). Accordingly, if you don’t know whom you are sharing your server with, you also don’t know how much traffic is too much traffic. Should your loading times get worse, you can switch to one of the WordPress managed hosting plans (starting at $24.99). Relatively inexpensive: hosting also includes technical support – although only hosting issues will be covered. Support: sometimes we experienced poor support. You also won’t get help for WordPress-specific questions. Email hosting is included for up to 100 email addresses. SiteGround is a hosting provider that is fully geared towards business. They offer a combination of outstanding support, reliable performance and cutting-edge features in their higher plans. If you have a small project, but need a top hosting provider, you can check the StartUp plan for $ 11.95 per month: this will get you 10 GB of storage, but you can only have one site. If you need more space, or want to host more than one site, you can have a look at their GoBig plan: for $ 19.95 you will get 20 GB of space and advanced WordPress features (e.g. dynamic caching). Finally, the GoGeek plan offers 30 GB of space, better caching options and advanced features such as a staging, or a Git repository, for $ 34.95. All these plans include the domain name and email accounts, so they have everything you need to start your WordPress site. Be aware that they offer big discounts during the first year. Support: SiteGround’s support is top class. They offer 24 hours responsive support by phone, live chat and email. Costs: If you want to have all the features you’ll need to get the GoGeek plan – this can be a bit expensive. They offer important discounts during the first deal term. Hosting location: They have servers in the US, Asia and Europe. An integration with the CloudFlare CDN is also mentioned. Speed & uptime: With their combination of solid hardware (e.g. SSD disks) and advanced software solutions (e.g. caching plugin) your site will be really fast. Additionally, they offer outstanding levels of uptime (close to 100%). Staging area & Git: Advanced developers that need slick features such as a staging area or a git repository, can go with the GoGeek plan. Visits & bandwidth limit: unlike many similar providers they don’t have a visit or bandwidth limit. Security: They monitor WordPress-related security threads on a daily basis. WordPress and plugins can be updated automatically and they make daily backups for your protection. Not sure whether to choose Bluehost or Siteground? Find an in-depth comparison of the two here. And Where Can I Find Good WordPress Templates? One of WordPress’s greatest advantages are easily the many templates you can acquire at low prices. We would advise against using one of the many free templates out there – sometimes, the designers will include SEO links to untrustworthy websites. Premium templates will not cost you much, and can be purchased on websites such as Themeforest or Elegant Themes. Our experiences have been limited to Themeforest so far. Prices start at single payments between $30 and $60. How often was this template purchased so far? The more customers, the better the support for that particular template will be. Take a look at the change log, too. Reviews: Have other customers experienced any problems? Responsive: Only purchase a template if it includes a mobile web view. How Do You Install a Template? After activating the template, it might look broken. This is normal – you need to add content now. Check the template documentation for any changes you might have to make. And please be aware of the difference between a page and a post. Pages are usually static, such as the “About Us” page on a website. Posts are news items of some sort, usually with a date and time attached. What About Security In WordPress? There are some basic ground rules you need to follow for your WordPress installation to be safe. Choose a secure password! The longer and the more special characters it has, the better. The same goes for your web hosting service password, of course. Change the standard WordPress login name from “admin” to something – basically anything – else. Never create any content from the administrator’s account. Should it be hacked, the attacker will have full control of your website. Create a separate account with limited permissions, and use that to publish content (Tutorial). Create regular backups (if possible, daily). Most web hosts will offer a backup feature (as is the case with BlueHost or WPEngine). Keep your WordPress version, your theme and your plugins up to date. Whenever there is an update, you should install it. Otherwise, your website might be open to attacks. Any unused plugin should be uninstalled completely. And be careful: Before making an update, create a backup in case of any issues. Ideally, you should test updates in a sandbox environment first. Are There Any Must-Have Plugins? If you want to be found in a web search, we recommend Yoast SEO. This free plugin allows you to customize the page title and description. You can also see right away how Google would show your website in the search results list. To top things off, there are plenty of very useful settings for advanced users that can be managed via the Yoast plugin. TinyPNG is a very useful plugin and free (up to 500 pictures per month) as well. It shrinks image files (jpg and png) with no loss of quality to increase loading speeds – loading speeds have become an important ranking criterion for Google. Akismet is also a must-have plugin – it helps you in your fight against comment and trackback spam. Alternatively, you can also use Disqus to manage comments on your site. This will prevent spam comments too. A very frequent question is how to make a website multilingual. At WebsiteToolTester, we use WPML.org, which is pretty much the standard plugin for that case. It starts at $29 per year, and adds language variety pages to your complete WordPress installation (backend and frontend). Polylang is another plugin used to create multilingual websites with WordPress and it’s free. Recently, it has become very popular and it’s the default solution for many developers. One of the most popular eCommerce plugins for WordPress is WooCommerce. The basic version is free and enriches your WordPress website with a powerful online store. If you want to know more about this plugin, head over to our WooCommcerce review. Another very interesting solution is Shopify. The powerful ecommerce platform can be directly integrated into WordPress now. Also check out our Shopify review here. There are great plugins to make premium content available for customers via login. MemberPress and WP Wishlist are often used to distribute text, video, or audio course materials in a protected member area. You can set individual levels of access and set up payment for membership through the plugin (e.g. via PayPal, Stripe), either as a single payment or as a regular plan. These plugins will cost you ~$99 / year (including one year of support and updates). So far, we’ve always used Upwork to find WP developers that get paid on an hourly basis. They will do theme and design modifications, plugin installations, WordPress updates etc. This can either be a one-off project or something ongoing. When working with the same person on a regular basis, they will be much more familiar with the ins and outs of your particular installation. Make sure you check the freelancers’ ratings and don’t just go for the lowest price. Are There Any Good WordPress Courses? A good example is The Complete WordPress Website Business Course. It’s got thousands of 5-star reviews and often sells for as little as $15 on Udemy. But there are many more WP courses for every taste and interest. You find the overview here. As you can see in this review, WordPress is just the right choice for some projects. When compared to Weebly or Wix, you will, of course, need more time in the beginning to get the hang of things, and even if WordPress is free in and of itself, hosting, templates and programming costs will most likely run you a higher bill than just going with a website builder. But if you already know that your project is set to go beyond the scope of what a website builder can handle, we recommend investing the money and saving yourself the hassle of a move later on. WordPress is future-proof, and the possibilities that come with it are practically infinite. Are there any WordPress questions left? If so, please leave a comment below!